Sensors – Fingerprint, gyro,Accelerometer,proximity, compass, light. Type – Super LCD5 Capacitive touchscreen with 16M colors. This device was launched in January 2017. 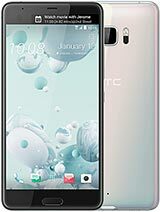 HTC U Ultra smartphone comes with a 5.70 inches touchsscreen display with a resolution of 1440×2560 pixels. Under the hood this device powered by 2.15 GHz Quad Core Snapdragon 821 processor and it comes with 4 GB LPDDR4 of RAM. The phone packs 64 gigs of internal memory. As far as the cameras are concerned, the HTC U Ultra packs a 12-Ultrapixel primary camera on the rear and a 16-megapixel front shooter for selfies.